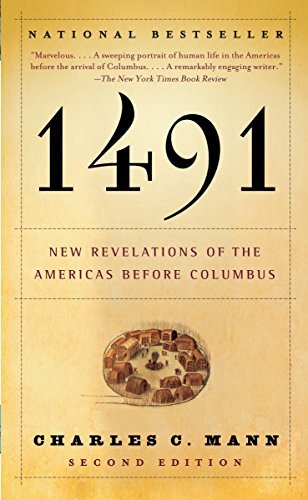 A groundbreaking analysis of America prior to the European arrival in 1492 describes how the latest research of archaeologists and anthropologists has transformed long-held myths about the Americas, revealing that not only was the population of the hemisphere greater than previously known but that the cultures were far older and more advanced. Reader's Guide available. Reprint. 125,000 first printing. Contrary to what so many Americans learn in school, the pre-Columbian Indians were not sparsely settled in a pristine wilderness; rather, there were huge numbers of Indians who actively molded and influenced the land around them. The astonishing Aztec capital of Tenochtitlan had running water and immaculately clean streets, and was larger than any contemporary European city. Mexican cultures created corn in a specialized breeding process that it has been called manâs first feat of genetic engineering. Indeed, Indians were not living lightly on the land but were landscaping and manipulating their world in ways that we are only now beginning to understand. Challenging and surprising, this a transformative new look at a rich and fascinating world we only thought we knew.